Classifications are a specific type of structured annotation provided by default in OME. Support for this organisational hierarchy is built into both the OME Web and Java user interfaces. Classifications are assemblies of images based on image content. In OME2.4.0, we are supporting manual classification, where a user defines a Category Group, and individual Categories within each Category Group. 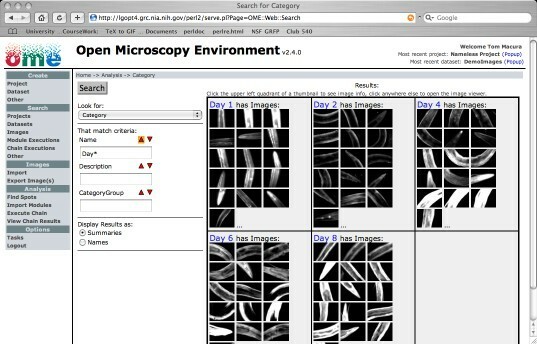 Figure 5 shows an example of this, where images of C. elegans are classified by age. Here, the user has defined a Category Group called Age and a series of Categories called Day 1, Day 2, Day 4, Day 6, and Day 8. In Figure 5, the user has used the OME Web UI Search Function to find all images that have a Category that matches "Day*" (where "*" is used as a wildcard). Classifications are a separate, parallel hierarchy to the Project/Dataset/Image hierarchy used within OME. Using classifications, images across multiple datasets can be assembled into groups according to their similar content. At the moment, all classifications are manual and user-defined, although this structure lays the groundwork for adding automated image classification later in 2005. In OME, each Category belongs to a Category Group. An image cannot belong to two Categories of the same Category Group but may belong to two Categories of different Category Groups. Therefore the images shown in Figure 5 could also be assigned to a separate Category Group called Body-Part with Categories Head, Body, and Tail.